The first Thanksgiving as we know it was celebrated in 1621 in Plymouth, Massachusetts. It was a celebration that was born from the pilgrims desire to give prayers of thanksgiving to God for giving them a good harvest. Thanksgiving was tied to religious celebrations for hundreds of years, but today there are many secular celebrations as well. Many times, Thanksgiving is over shadowed by Halloween and Christmas because it’s not as flashy or filled with gifts and treats. 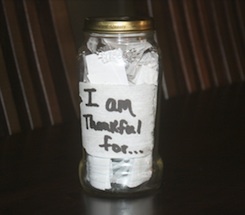 Visit Renee Gardner's blog, Nanny Needed, for 5 Fun Ways To Teach Kids About Thanksgiving.